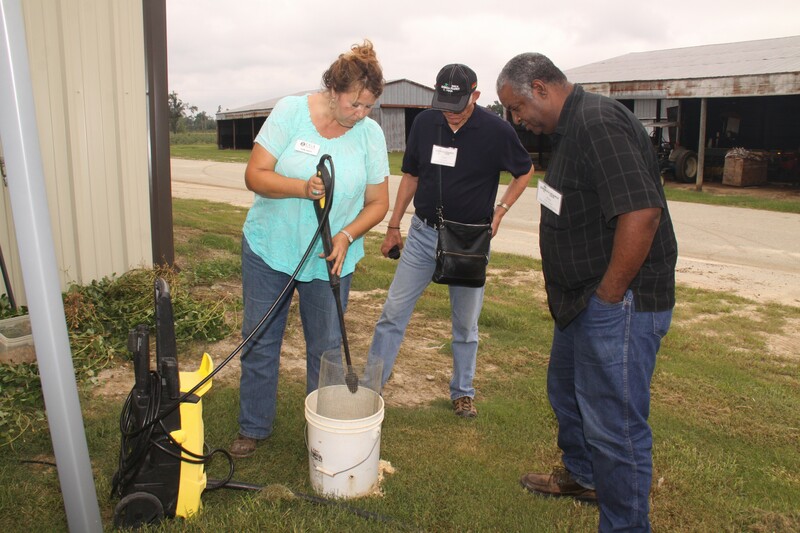 Even though the Georgia Peanut Tour did not travel through Jenkins or Jefferson County this year, an update was provided by local county extension agents. 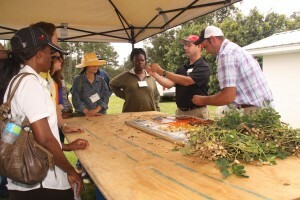 Both agents demonstrated how farmers determine maturity through the peanut profile board. Wade Parker, Jenkins County Extension agent, showed attendees how farmers pod-blast their peanuts before placing the sample of the maturity profile board. He says, knowing when to dig peanuts can mean the difference between loosing and gaining 200 lbs. per acre. The pod-blasting process is a good method in mitigating peanut losses. Parker, updated tour attendees on agricultural production in Jenkins County. Parker stated the major crops grown in Jenkins County are cotton, soybeans, corn and of course peanuts, where they planted roughly 5,550 acres this year. “The most troublesome issue for farmers this season would have to be the dry weather the latter part of July and first of August,” Parker says. “Spider mites are a major problem in peanuts. Most farmers are hoping for a timely harvest operation in order to avoid a costly treatment” he adds. Thirty-five percent of the counties peanuts were irrigated compared to 65 percent that were dryland. Pam Sapp, Jefferson County Extension agent, also provided an update on Jefferson County. The county has a total of 6,500 acres of peanuts planted this season with an estimated production of 3,600 lbs. Jefferson County mainly plants cotton, corn, soybeans and peanuts. Peanuts in this county are 40 percent irrigated and 60 percent dryland. According to Sapp, the most troublesome issues farmers have faced in this area have been lack of rainfall and a late season.